We stock 0.7m high 3 axle stepframe platform trailers from Broshuis, Doll, Nooteboom, TSR, King and Faymonville. 20 tonne payload, and may be operated under special types. 15.5m length in the lower deck opened. 0.7m deck height in the lower deck, 1.5m in the upper deck. Peep-throughs with detachable wheel cover plates. 205 65 R 17.5 tyres in double formation. We stock 0.8m high 3 axle stepframe platform trailers from Broshuis, Doll, Nooteboom, TSR, King and Faymonville. 15.2m length in the lower deck opened. 0.8m deck height in the lower deck, 1.5m in the upper deck. 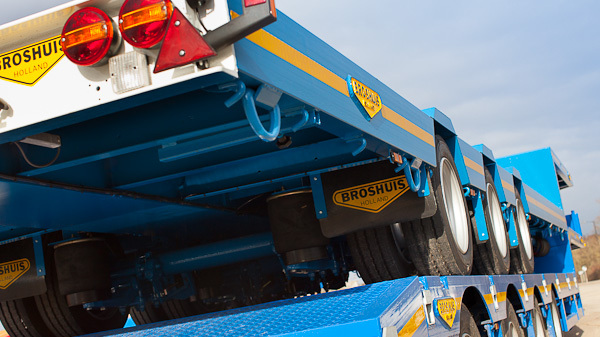 We stock 0.9m high 3 axle stepframe platform trailers from Broshuis, Doll, Nooteboom, TSR, King and Faymonville. 30 tonne payload, and may be operated under special types. 15.7m length in the lower deck opened.